Just read all 30 pages of this and while i had already looked into doing an 8.1/4L80e swap into my Tahoe Limited, i now want to do this asap!!! great job on the build. 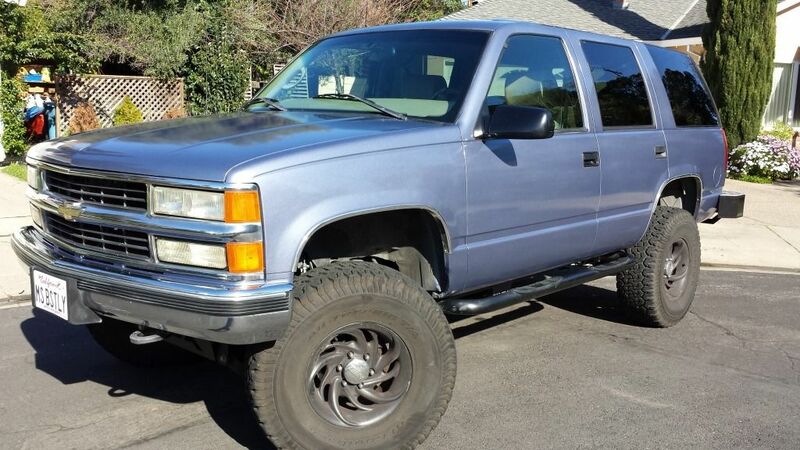 i had a deal lined up to buy an 02 3500HD that was the GMT400 body style so the swap would have been very easy i believe but the deal for the truck fell thru so im back to searching. A lot of the guys who've commented in this thread now participate on a Facebook page for 8.1Ls. A wealth of information and no forum BS. And I wasn't invited. I'll try not to have my feelings hurt. I just searched around on FB and couldn't find it. Can someone point of put to me? I'm interested. I used the link you provided...like already said, it's a closed group. I asked to join...I hope I'm popular enough to be allowed in the "cool" group! 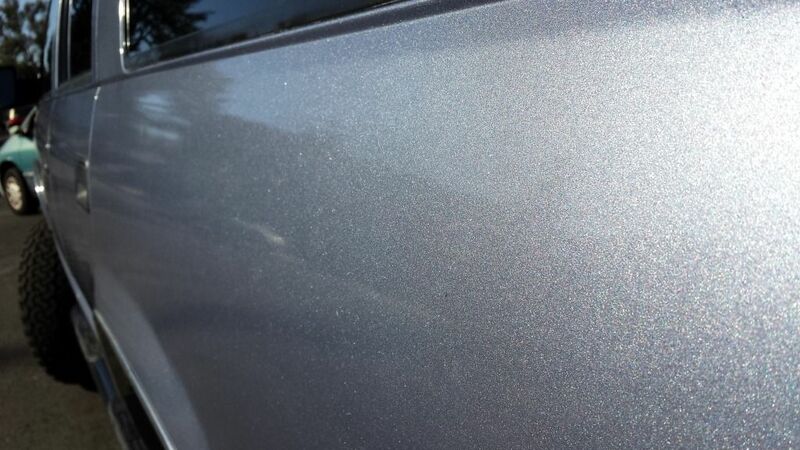 Here's a close up of the metallic paint. Very nice. Looks good in both sunlight and fake light, not an easy thing for paint to do. No, except for the parking change kept in the center console. That was irritating. Worse than that, though, was the cutting off of the connectors for my headrest monitor screen. Clipped of all 5 RCA connectors apparently in prep for stealing the headrest. That was about 2hrs of labor to repair. Stupid headrests are only $150 for the pair. Spent only 1 hour installing them. I blew a fuse when I saw that and chewed out the painter pretty good. He was embarrassed, of course, and said he would make it right. He didn't. Don't care anymore. My truck is painted. He got paid. The job was a C grade job, with some idiocy thrown in. The key was the prep (which I did - not experienced, but thorough) and the quality of the materials, which was PPG brand, which many professionals swear by. I think I got what I wanted at a decent price. Could've been a lot worse. That's why most of us do our own repairs/rebuilds. Engine, transmission etc.... Too much subpar workmanship.. Sorry to hear about your troubles. Ex in laws had their Toyota FJ Cruiser stolen a week after having a remote starter install. Since a key fob chip located in the steering column permanently disable the oem anti-theft for the remote start, all that's needed to steel it was a plain key copy. And how many people would have known that particular FJ was set up that way, and where it lived? My guess is whoever installed the remote start. Oh yeah no doubt. Not only that, they where caught on camera but too far to identify. Two non-white dudes, walk strait up to the SUV, got in from the back door, (I'm guessing, the rear door switch was disable which the owner would have never noticed). And drove off as if nothing! I didn't do a good job documenting the build, but some of the pics were already posted earlier http://www.pacificp.com/forum/viewtopic.php?t=11471&start=590. Here is the finished product. 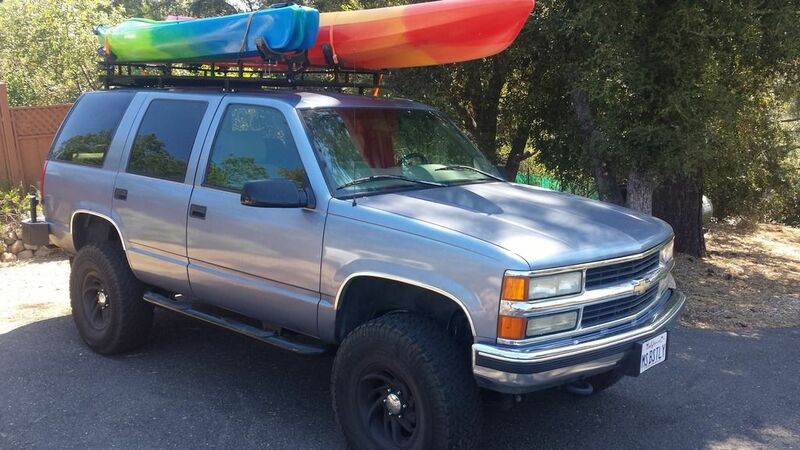 It has the mountings for carrying kayaks in this pic, but I also have bolts on the side for a hi-lift jack and plan to mount the holders for the shovel and other accessories. With the 3rd row seat added, I really needed this rack and it definitely makes her the vacation-mobile that it was intended to be. The solar panel is installed on the back 1/4 of the rack and it keeps my accessory battery topped off nicely. Never have to worry about that battery anymore. My plan was to install a 14b 9.5" 6-lug rear end with 3.73 gears that I picked up for $400 from a Craigslist dude in Sacramento (4 hr round trip). I was originally planning to do a full rebuild on the axle, install a ARB locker, and replace my 6" lift blocks with properly arced leaf springs (probably about a $3-4k job). I was planning to take my time doing it. So, since my truck is my daily driver now and the fact that we are planning to go to Tahoe in two weeks, forced me to accelerate the 14b install. So....plan B: install the 14b rear end as fast as possible at minimal cost. I spent a few days removing the sludge from the replacement axle. (I cannot install dirty parts on my truck). Took the weekend to install the new rear end and got it done in a couple of days. The only mods I had to make was grinding the u-bolt clamp pieces to accommodate the larger diameter axle tube and add a few mount points for the parking brake cable. Got it all mounted up. 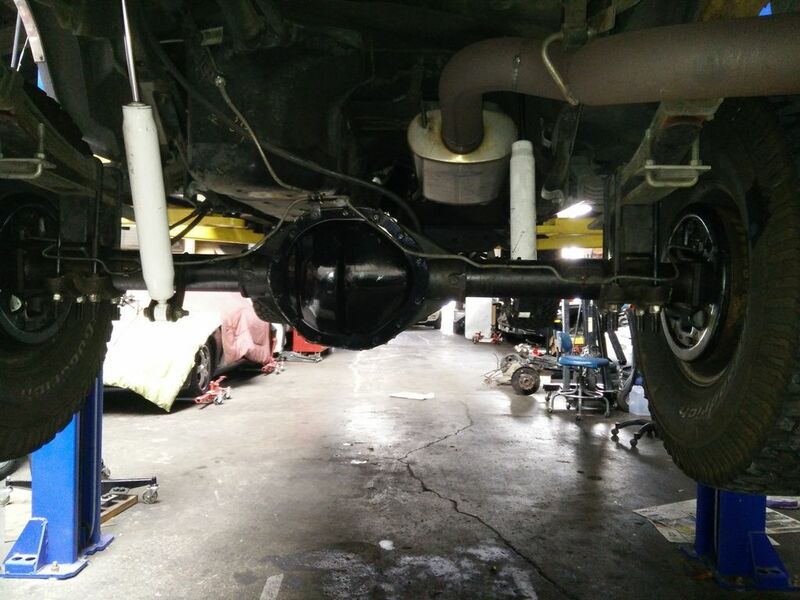 Went back to Steve at South Bay Driveline and had him shorten the driveshaft by about 1" and change the driven yoke to match the new rear end (GM 1350 yoke). $240 and he got it done in a few hours. Love their work. 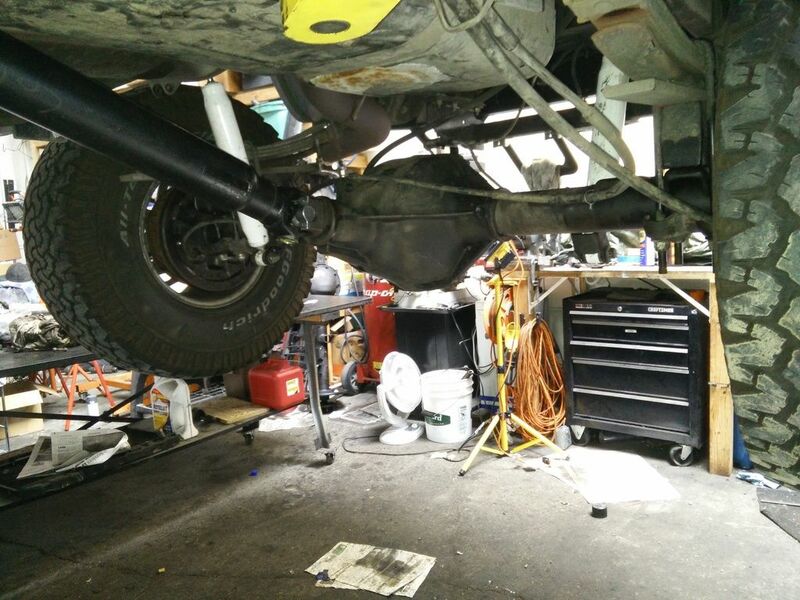 The replacement axle did not have pads to mount the rear sway bar, so I was considering how to deal with that. In my haste, I just left the sway bar off for now, thinking I would add the mount points later. It was also my plan to switch the sway bar from mounting under the axle to mounting on top, since the lift kit leaves plenty of room for it. 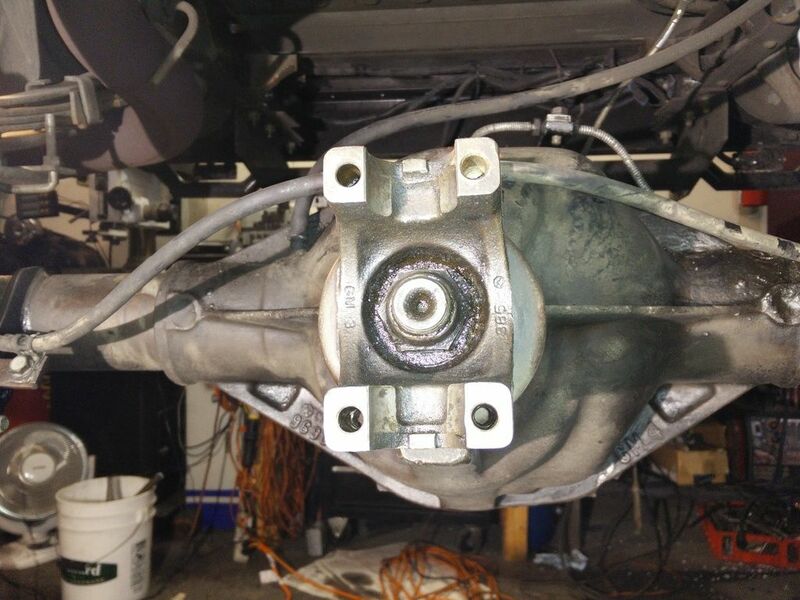 After driving with the new axle, I see no need for the sway bar at all. The difference is barely perceptible and the look and clearance are much improved without it. Tested my 4WD and it seems to work. I expected my speedometer to come back to accurate, but it is still reading 10% fast. I will have to figure that out. It's a relief to have this upgrade finally complete, which gives me a lot a piece of mind. Ready to just drive for a while, instead of wrenching.